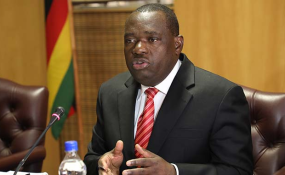 Minister of Foreign Affairs and International Trade Sibusiso Busi Moyo (file photo). Staff at Zimbabwe's embassy in Mozambique reportedly went on strike Monday, protesting against unpaid salaries in a new diplomatic embarrassment for the embattled Harare administration. The reports come at a time when Britain's foreign office recently revealed that the Zimbabwean embassy in London was among the top three tax-dodging foreign missions based in the UK. According to reports from Maputo, some of the striking embassy staff said they had not been paid for three years. "We have opted to go on strike because the Zimbabwe Embassy workers are facing problems getting salaries, and some have not been paid for the past three years and it is no clear why this is happening," an embassy employee told the privately-owned television station Soico (Stv). Embassy officials did not comment on the development and NewZimbabwe.com was not able to verify the reports with Harare Monday night. The job action comes at a time ailing foreign affairs minister Sibusiso Moyo has been away from work for nearly four months. Moyo recently made a brief public appearance as President Emmerson Mnangagwa received new diplomats in Harare. He has however, not travelled with Mnangagwa on his five-nation foreign trip which will take in Russia, Kazakhstan, Belarus, Azerbaijan and Switzerland. Zimbabwe has long struggled to finance its foreign 46 diplomatic missions due to foreign currency shortages. Some of the missions have been hit with eviction notices over unpaid rentals with salary arrears for staff, in many cases averaging 12 months. Earlier this month, the British government revealed that Zimbabwe's embassy in London owed some US$129,000 in unpaid taxes. Meanwhile the Maputo strike coincided with mayhem back home as outraged Zimbabweans protested against the government's weekend decision to hike fuel prices. The violent protests were mainly concentrated in Harare and Bulawayo with the national security minister saying there had been fatalities without specifying the numbers killed. Accusing the opposition and civil society organisations of being behind the protests, Owen Ncube said in a statement that "regrettably, this has resulted in the loss of life and property including injury to police officers and members of the public. "We express our deepest condolences to the bereaved families," he said in a statement cited by the state media. He said more than 200 people have been arrested in connection with the violence. The Zimbabwe Association of Doctors for Human Rights earlier reported that at least 13 people had suffered gunshot wounds during the protests.